I made this dish to follow along with the #MadeWithChobani project, though I’ve got to say that I’ve been a yogurt-lover for awhile now. In this capacity, plain Greek yogurt (Chobani, holler) is wonderful at tenderizing the chicken, and bringing a bright kind of tang to the finished dish. If you’ve got a few hours to let the chicken marinate in the yogurt, use that time! If not, just mix the chicken and yogurt quickly and then get on with the rest of the recipe. If you can’t find the spice mixture called garam masala, you can easily make your own by combining 1 tablespoon ground cumin, 2 teaspoons ground cardamom, 1 teaspoon ground black pepper, 1 teaspoon ground coriander, 2 teaspoons cinnamon, and a pinch each of crushed red pepper flakes and nutmeg. Also, if you’d rather make this in the slow cooker, it can be done! Just follow this recipe. Place the chicken pieces and yogurt in a heavy-duty ziplock bag (or large tupperware) and let marinate in the refrigerator for about 6 hours, or overnight (you can totally skip this step if you don’t have time). In a medium Dutch-oven, warm the butter and olive oil over medium high heat. Add the onion and sauté until just beginning to brown. Add the minced garlic and fresh ginger and sauté another minute or two, then add the garam masala and paprika, stirring to incorporate and toast the spices. Stir in the tomato paste and diced tomatoes, then add the yogurt-covered chicken, stirring until everything is well mixed. 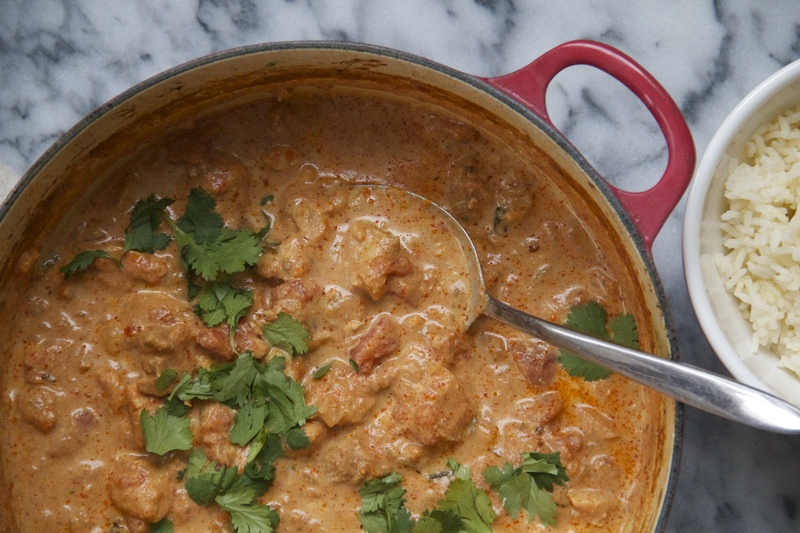 Place the lid on the Dutch oven and let the chicken tikka masala cook for about 4 hours, until the meat is fully cooked through and ridiculously tender. 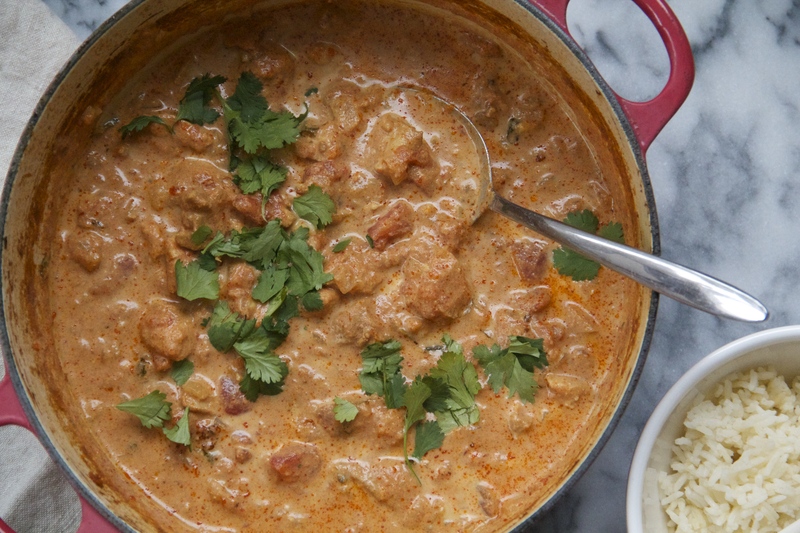 Serve the chicken tikka masala hot from the oven, topped with cilantro and served with plenty of rice. While you have been taking a well deserved break from cooking, I have been impressing my family with creative and delicious dinners from your new cookbook! I don’t remember where I first learned of your cookbook but I added it to my Christmas list this year along with a sheet pan. Overall, I enjoy cooking but have fallen into a rut of the same old recipes and needed some inspiration. Your cookbook has motivated me to try some new recipes. My family raved about the steak fajitas! Last night, I made the chicken with cauliflower and apricots-it was delicious! It was an easy dinner to prepare after a day of work. Thank you! Take care and keep creating wonderful recipes! 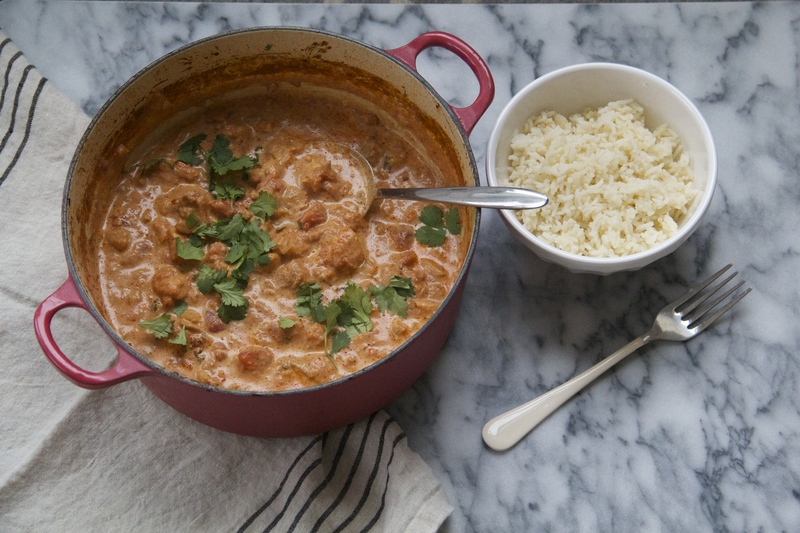 This Slow Cooked Chicken Tikka Masala was a real winner. Easy to make and absolutely delish! Thanks so much Molly for these great cooking ideas! What can I substitute for the tomatoes? Brenda, I’ve only tried it with tomatoes, but if you’re avoiding acidity I’d try substituting roasted red peppers or even roasted squash. If you do, let me know how it turns out!